Reposted from Laura Leigh’s Blog appear latest entries first. There is a circulating rumor that no horses are in Riddle and Kiger anymore. Animals are being released (and a few left) to create a breeding population that will continue to give the adoption program “Kigers.” It is how this “Kiger” thing works. This has been, and will continue to be, more akin to a “range breeding program” than managing a wild population. In order to maintain that you need “breeding stock.” The herd was rounded up to remove the “white” in an attempt to create a specific outcome for the next foal crop. My photos are being circulated with this rumor. Please be aware that these photos are copyright protected as stated on this website. Any insinuation that they come from another individual is against the law. Expressed permission is required from myself to include in any newsletter or publication. If you put the pics on a message board you must link to the source and not imply you took them. If it becomes necessary that I take the time to watermark I will. I have avoided it because it takes away from the content and focuses on author… but I will slow my process down if needed. Just quickly adding a bit more about conversation at the Burns Corral. There were major philosophical differences but many areas of agreement. Personal opinion on the wild v. feral debate is irrelevant. That concept is not understood by many that support or work in this program, Burns was no exception. Wild Horses are more appropriately reference as a “returned native species.” This makes them compatible with the ecosystem. Wild herds of horses are not the same as European cattle on a range or a pack of golden retrievers. However if Congress said the retrievers were to be managed as “wild” then that would be the law. But back to the Burns Corral. While I waited for the first load of Riddle horses a couple pulled in with a trailer. They were returning a horse to the BLM. They plan on adopting two younger horses at an event where the horses have already had some training. I was told that they would not have trouble finding him a new home. I was surprised. An eight year old gelding that now has one strike, in this three strike system, that was returned “untrainable.” No problem? OK… an extra mile. I was told other stories about horses with “no where” to go. Including those that made their way to employees home corrals. Then I meet the grey. The grey that wanted to jump the panels in holding. The grey that showed real fear. I said that if they can’t place him to let me know and I would give it a try. I was told that he will be adopted at the fall event, confidently. I will check back on him, though. Wanted to add a picture of the padding. It was nice to see this. It will be nice to see this at Temporary. If I have a competent BLM wrangler proudly express that they cut down “significantly” on injury there is no reason BLM contractors should not be using them as well. To me this is an example of how a “simple” discussion gets turned into “battle lines in the sand” because of an obstinate connection with the past and prideful ways. To me this is a clear example of most of the dialogue that occurs within this program. Simple conversations are met with an obstinate attitude that if you are an “advocate” you have no knowledge worth listening to. If you care about a foal that suffered hoof slough after a winter roundup over volcanic rock, you are an “emotional” responder without comprehension of horses. I’m getting tired of it. I was not received that way at the Burns Corral and for that I thank them. There are other horses at the Corral that need adoption. This sweet young thing saw me pull around and cautiously came to the fence line. After a minute to reassure I was touching a velvet muzzle. Cute bug. Another couple pulled into the lot. They were looking for a horse, maybe two. I also believe they were looking for information on the program itself. We talked and I showed them horses and talked about making sure they choose a horse suitable to their purpose and not just for color. We talked about the prison training programs and other HMA’s. They took an adoption application and asked for my card to help them find a horse. I then had to explain who I was. They asked if I did training. I explained I live on the road but.. for me things can take two months, six months a year or never happen. For someone like me it’s about the journey of relationship and not the destination. They shook my hand, took contact info and left. I think I will hear from them. When I do I think they will have adopted horses from Twin Peaks. I’m tired and I apologize for the unedited rambling that may be a hard read. Yet I wanted to get these out before they are buried in the next chapter. Every once in awhile I make a post that defines my blogging, as opposed to the articles I write and the reports for equine welfare agencies. A blog is defined as an online journal or diary. It is where I post (as listed) information, thoughts, photographs and expressions with horses at the heart. My articles can be found in several venues including Horseback Magazine. Often the publication I am doing a piece for will express a desire that I write first person and include personal thoughts or narrative. Photographs and video have been used by news broadcasting agencies to illustrate their stories including: CNN, BBC, KLAS-TV, local CBS and ABC stations. Those are some of the different venues in which I am published. But this venue IS my blog. ~~~ Riddle is now over. The Burns district will close this roundup with a release of dry mares well into the Riddle HMA tomorrow. I spent the day today at the Burns Corral for vaccination. These are beautiful horses… and yes there is one that I have gotten a “thing” from. He is a beautiful grey. He is one of those horses that “are what they are.” He has a feel to him that speaks of not being a good adoption candidate and should be in sanctuary. At holding he ran the panels and I thought he might try to jump. He was one of the few horses today that showed fear and not just “cautious nervousness” going through the chute. He looked me in the eye… he needs to be as “free” as we can get him. For now… this is my blog. AND as long as we are with the Kigers…. I would ask those that dismiss “wild and free” how much time they have spent being free of the constraints of what others think is appropriate? How much have they defined themselves and not followed a pre-conceived notion? AS far as horses… I would ask how much time they have spent on the range with the wild ones? How much do they understand that some of them “are what they are?” Some are suitable partners with man… and historically they have carried that relationship as beasts of burden, companions in war and any way we have determined their “usefulness.” But me… I would rather die out there with the mosquitos, rattlesnakes and wild horses than to sit in an expensive restaurant in my Armani suit rubbing elbows with “accomplished” humans. There are horses like that too. Kiger is over and there are some “stories” to tell. Too tired to type and need to be up at 4 am. Here is the “report.” I know it is a bit “dry” but I wanted to address the difference of “Kiger” and the rest of the agency. Kiger is a range breeding operation. This is a highly managed population. This is not “natural” management of a wild population. It has it’s plus side, adoptions. But I’m a purist. This is not what the Act intended. just my ever so humble opinion. The Bureau of Land Management (BLM) Kiger roundup completed today with the release of 15 studs (edit: 14. One was pulled for “white on a foot”)back to the range. Studs chosen for color and breeding potential were returned. Mares for release will be determined later. 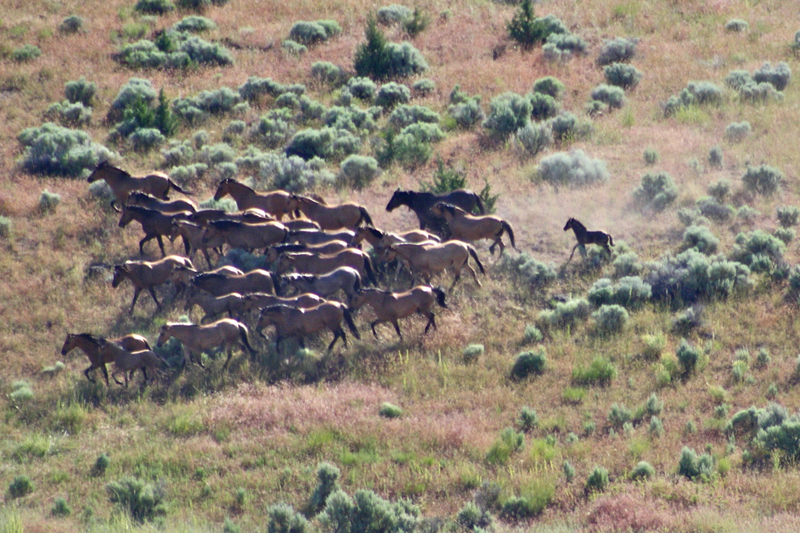 The Kiger herd has historically been a successful “range breeding” operation for the BLM. Kiger horses have had an unheard of 100% adoption rate. Yet the community and local offices work hard to promote them. “Kiger” is the name of the Herd Management area. Yet you will here people say there are “Kigers” in South Steens or even in Twin Peaks. “Kiger” is more accurately described as a coloring and not a breed. However a very successful breed registry has been formed. The horse used as a model for the Disney movie “Spirit: Wild Stallion of the Cimmaron,” was a Kiger and added to the popularity of the herd. The criteria for selection to be returned to the range was “get the white out.” Any horse that had white on face or feet went to the Burns Corral in Oregon for the adoption program. After reviewing photographs many of the released animals bore freezebrands. This indicates that they were released from a prior roundup, most likely for breeding potential. Horses will be made available for adoption through the Burns Corral. A internet “book” of adoptable horses will be uploaded to the website this fall. The corral has horses there for adoption that are not “Kiger” that are worth consideration as well. Two horses have been reported as casualties of this operation. A young horse found dead in holding and an older horse euthanized for a pre-existing condition. Kiger Roundup over. 15 studs released today. Decisions on mares pending. WE move to Riddle am. I was on the road again all day yesterday. Got to bed at 1 am… woke at 4… going to sleep. Lots to write about… will soon. Gelding prior to release is OFF the table. No horses to be gelded. More later… exhausted.Got one hour sleep last night. Spent sunset at Sheldon. Update on Sheldon soon. 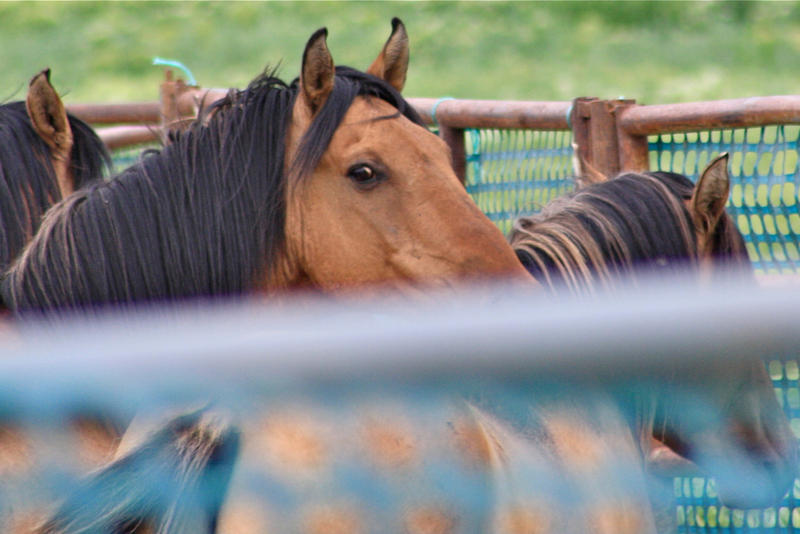 Full Report from Wild Horse Education AFTER sleep.